Our Cooking Classroom in our Belleville Country Store has been as busy as a bee hive this week! We have hosted groups of adults and kids in a variety of classes and birthday parties and we’ve even hosted a group of high school educators. Yesterday, Lana and I had a terrific group of folks for a Lunch and Learn Cooking Class where we featured three delicious apple recipes. The guests loved every bite of it, especially the Pork Sausage and Baked Apples. This recipe comes in handy because it can be served for breakfast, lunch or dinner. It features homemade Italian sausage from our butcher shop and sweet apples grown in our orchard. We used Fuji apples but you could substitute another apple easily. My recommendations are Jonathon, Golden Delicious, Gala or Braeburn. To feed our class of thirty, we quadrupled the recipe but when I make this recipe at home, I follow the amounts below. Lana and I squeezed the pork out of the casings before browning the pork in the skillet. 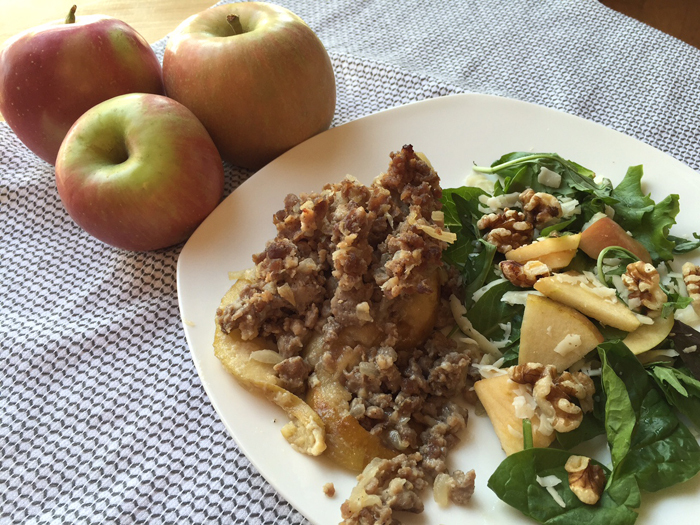 While the pork browned, we baked the apple slices for a few minutes to soften them up. After our pork was no longer pink, we stirred in the egg and brown sugar before topping the partially baked apple slices. Then we returned our baking pan it to the oven for 8 more minutes to complete the recipe. To pretty up the plates, Lana and I served the pork to our eager classroom guests with a generous side of the Eckert’s Restaurant House Salad featuring Swiss cheese, Fuji apples and walnuts. We knew we had a successful recipe on our hands when we went to collect the empty plates! 4 links of Eckert’s Pork Sausage, casings removed, about 1 lb. Preheat oven to 350°F. Grease bottom of 9-inch baking dish with butter. Arrange apples in bottom of dish. Bake 6 minutes. Meanwhile,in a skillet, cook sausage and onion until sausage is no longer pink; drain. Spoon into medium bowl. Add brown sugar and egg; stir to combine. Spoon sausage mixture over baked apples. Bake an additional 8 minutes or until apples are tender.